Complete with all accessories and installation instructions easy to install.? The excellent workmanship of the materials, great fit and great sound are the assets of Leovince. Leovince is now number one in Europe. Leovince systems are equipped with all necessary mounting hardware and detailed instructions.? For more info, click on the site at the bottom of this article? GranTurismo is the new exhaust system created by LeoVince for MaxiScooter 4Strokes, E-Approved in full respect of pending Highway Code. A name synonymous of guarantee: with GranTurismo LeoVince is developing a new sporty product all dedicated to the Italian style. The combination of silencer and collector GranTurismo represents the perfect synthesis among avant-garde design, resistance and long lasting. The logo comes out from the brightness of a brand new badge, closed in a triangular shape, which follows the silencer line: a new design by LeoVince. A conical body made in stainless steel, having a trapezoidal shape at the end cap makes the GranTurismo a sleek and elegant product. Additionally, it also assures a great resistance to the corrosion and it remains reliable at high temperatures. The silencer body is completely covered by a stainless steel heatshield: this solution, besides giving an exceptional look to the product, protects the silencer from the usury and it reduces the overheating, providing to the bike a performance increasing. 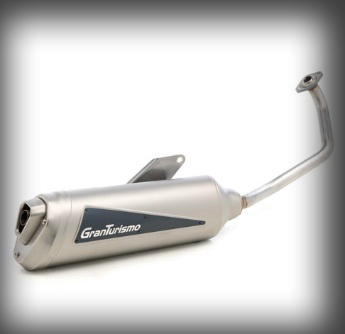 The inside part of GranTurismo is the result of a compromise between a dissipative silencers system and reactive silencers one. Thanks to the silicon-based soundproof material and a special anti-ageing filter, in a first step the exhaust gases and the noise are filtered; then they meet a multi-chamber system designed to guarantee noise reduction at the exit. The final issue of this system is a product approved, long-lasting and at high performance. The end cap, deep-drawn in stainless steel and internally welded, shows a top-level look: its atypical shape of irregular hexagon presents a smooth line, with rounded corners, perfectly following the ovoid curves of the whole exhaust. Thanks to a graphite bush, with a special internal structure, the junction to the collector is more flexible and safe: for this reason GranTurismo has a perfect resistance to the stress, vibration absorbing and a great lowering effect. Finally, a stainless steel bracket, which is different according each Scooter models and equipped with silent-block to soften the vibrations, impeccably completes this high-tech and innovative product.